Are you ready for some adorable diy baby Christmas crafts?! There are so many fun art projects we can do with our little ones around Christmas time. Today, you’re here to see how to make a charming cardinal handprint and a darling reindeer from your babie’s footprint. Canvas of choice – we used wooden hanging plaques. Craft paints – red, white, black, green, brown and gold. Brushes – sponge brush, thin detailing brush, paint pens and permanent black markers. Paint your babie’s sweet, little foot and try to do this quickly! Your little squirmer is likely to make a bit of a mess, so do this footprint craft project in a mess-approved zone. Press down firmly and quickly! This footprint is going to be you reindeer head. You will use your artistic skills to add the antlers and handwriting to personalize this diy baby Christmas artwork. This would be the perfect gift for grandparents! Here are some personalized baby Christmas ideas I found on Etsy! You must be a diy mom, like me! If so, taking pictures of your baby for the holidays should also be on your to-do list! I’ve compiled a baby Christmas photography post all about how to capture the perfect Christmas photos of your baby at home and with your cell phone! DOWNLOAD AND PRINT! 5×7 photo frame insert. Add baby photo or ultrasound image. 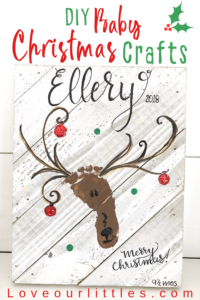 To make this adorable little foot print transform into a Christmas reindeer, you will need to pull out your inner artist! Simply paint or draw the antlers on, copy mine if you want! Paint your round ornament shape (let dry) and then add a layer of hot glue on top for a 3D effect. Sprinkle with glitter. They turned out really cool and gave the artwork a lot of dimension. Use stencils or free-hand your babie’s name on the artwork. I used a permanent marker for my hand lettering. Write out your babie’s name or the words you want to use in pencils first, then trace with marker. Use a thin line marker for your first outline, then go back over and thicken every down-stroke and Voila, you have just designed a hand-lettered font! 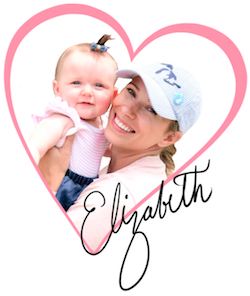 Customize with your babie’s name! Here’s is another diy Christmas baby craft idea! Turn your little one’s handprint into a Christmas cardinal. This project requires the same supplies and process and the first one. I encourage you to take a closer look at these original Christmas photo frame printables I have in my store. You can insert these into any 5×7 frame and add your babie’s Christmas photo you expertly took with the tips I provided in the “Christmas Baby Photography Ideas and Tips” post.